Astrophotographer Maxwell Palau captured this view of a total lunar eclipse from San Diego, California, on Oct. 8, 2014. Editor's note: To find out more about the rare supermoon lunar eclipse of Sept. 27-28 and how to see it, visit: Supermoon Lunar Eclipse 2015: Full 'Blood Moon' Coverage. This month's highly anticipated "supermoon eclipse" may be a magical treat for skywatchers, but there's nothing supernatural about the event. On Sept. 27, skywatchers throughout North and South America, Europe, Africa, western Asia and the eastern Pacific Ocean region will witness a total eclipse that happens to occur when the moon looks abnormally large and bright in Earth's sky. It will be the first supermoon eclipse since 1982, and the last until 2033. "When the moon is farthest away, it's known as apogee, and when it’s closest, it's known as perigee," Noah Petro, deputy project scientist for the Lunar Reconnaissance Orbiter at NASA's Goddard Space Flight Center in Greenbelt, Maryland, said in a statement. "On Sept. 27, we're going to have a perigee full moon — the closest full moon of the year." The moon is about 31,000 miles (50,000 kilometers) closer to Earth at perigee than it is at apogee. As a result, perigee full moons, also known as supermoons, appear about 14 percent bigger and 30 percent brighter in the sky than do apogee full moons (which are also called minimoons). 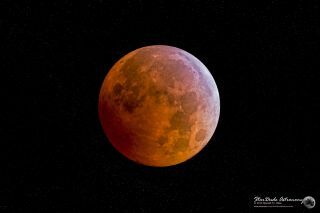 "Normal" total lunar eclipses — which occur when the Earth, moon and sun align, and the moon passes completely into Earth's shadow — aren't terribly uncommon: On average, a skywatcher in a given location on Earth can expect to see one of these events every 2.5 years or so. But it is uncommon for a total lunar eclipse to coincide with a supermoon. There have been just five such events since 1900 (in 1910, 1928, 1946, 1964 and 1982), NASA officials have said. Rarity does not imply anything inexplicable, however. "It's just planetary dynamics. The orbit of the moon around Earth is inclined to the axis of Earth, and the orbital plane of all these things just falls into place every once in a while," Petro said. "When the rhythms line up, you might get three to four eclipses in a row, or a supermoon and an eclipse happening." The supermoon will begin to dim slightly at 8:11 p.m. EDT on Sept. 27 (0011 GMT on Sept. 28), NASA officials said. The total eclipse will start at 10:11 p.m. EDT (0211 GMT), and it will last 72 minutes. Editor's note: If you capture an amazing view of the supermoon lunar eclipse or any other night sky view that you would like to share with Space.com for a possible story or gallery, send images and comments to managing editor Tariq Malik at: spacephotos@space.com.